By Rick Manning — Millions of words will be written and spoken about the so-called fiscal cliff that our nation faces should Congress and the president fail to act on the massive tax increases that are scheduled to go into effect on Jan. 1, 2013. The arguments will be intense with threats of government shut downs and all sorts of nonsense that the public will largely ignore. President Obama, Harry Reid and Nancy Pelosi will argue that raising taxes is the only way to lower the budget deficit, all the while having no intention of enacting real budget cuts that would impact the 30 percent increase in government spending since the end of Fiscal Year 2007. This represents an increase of approximately $810 billion a year in spending. By contrast, tax revenue in Fiscal Year 2012, even with all of the economic problems is only down by $113 billion from the end of 2007, when the government collected more dollars than at any time in history. Those who continue to argue for higher taxes on anyone need to answer the simple question of what they are going to do about the more than $800 billion surge in government spending over the past five years. If, they hold firm that the new, 30 percent larger government should be the baseline to gauge future government growth from, then Republicans are being asked to fall into the same old trap — let’s call it the Wimpy trap. In the back of your head, viewers strongly suspected that next Tuesday never came for Wimpy. The same will hold true for any promised budget cuts that are not both immediate and sharp. The proof of this is that for all the talk about budget cuts in Washington, government shut downs and the like over the past two years, the federal government spent a little more than $80 billion more in 2012 as it did in 2010. That’s right, with all the uproar and fights over the budget, federal government expenditures were higher last year than two years earlier. And that leads us to the real fiscal cliff, a cliff that is created not by the revenue or tax side of the budget equation, but by the spending side, which continues to grow over time. 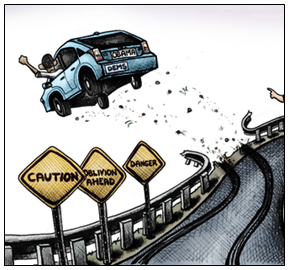 This seemingly insurmountable fiscal cliff has nothing to do with the tax fight, which will be resolved one way or the other before Jan. 1, but has everything to do with the battle over budget cuts that are mandated under the law. Republicans made a terrible deal last year, where they agreed to give the Democrats the votes to raise the debt ceiling in exchange for a pathway to budget cuts. Out maneuvered by the Democrats, Republican leaders allowed a majority of mandated (sequestered) cuts to come out of the Defense Department, while both entitlement programs and the other discretionary spending was left relatively unscathed. And in spite of all the posturing, the Defense budget would only be cut by 10 percent under the scheduled “sequestration cuts,” or around $50 billion a year, less than the amount of increased spending by the Feds over the past two years. When $50 billion in spending cuts out of a $500 billion plus budget for one Department is viewed as catastrophic by those who argue for cutting the size and scope of government it is hard to argue with a straight face that spending will ever get under control in Washington, D.C.
Rick Manning is the Director of Communications for Americans for Limited Government.